It’s funny how my tastebuds have changed since adopting the Paleo way of eating. Don’t get me wrong, I still have a bit of a sweet tooth, but the sweet things I like are not nearly as crazy sweet as the sugary treats I consumed before. 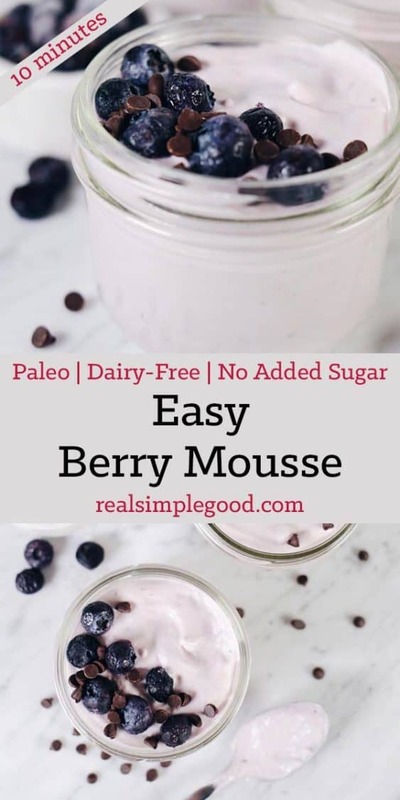 This easy berry mousse is a perfect example of a sweet treat that I love that actually has no added sugar, just the natural sugar from the berries used. The hardest part is waiting for your coconut milk to chill in the fridge for 12-24 hours. Once you’ve properly chilled your coconut milk though, just toss all of the ingredients in a food processor and pulse until everything is smooth and creamy. Then, pour into single serve dishes, cover and refrigerate for about 4 hours (or more). The waiting is really the hardest part! 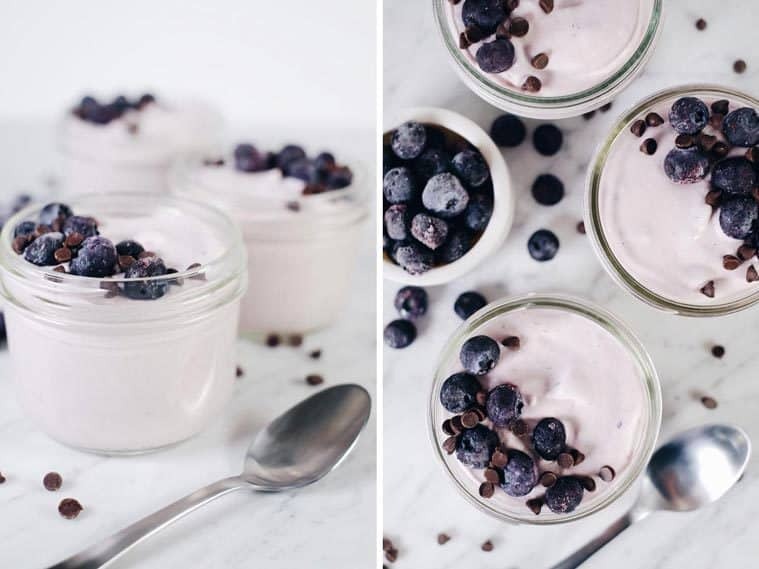 Once the mousse has chilled for at least 4 hours, go ahead and enjoy! Top it with your favorites. 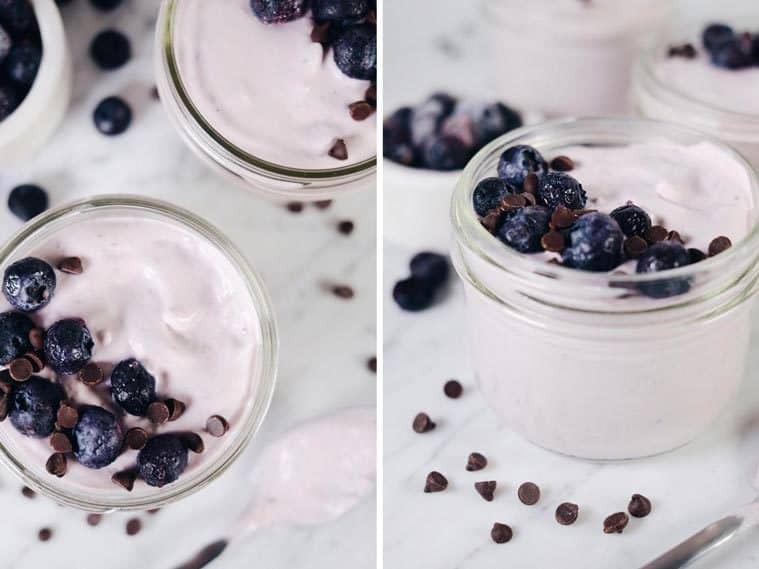 For these photos I added some extra blueberries and a few Enjoy Life chocolate chips. Raspberries, coconut flakes and raw cacao are yummy, too. I just didn’t have any cacao on hand when I took the photos. Seriously though, whatever toppings sound good, just go for it! Make sure you use full fat coconut milk. It won’t get all fluffy if you don’t. We always use Aroy-D coconut milk, and find that it gets perfectly fluffy and light. We also like Aroy-D brand because it is not in a can, which eliminates BPA risk. Collagen is listed as an optional ingredient, but I’d say definitely add it in! It is great for your gut, hair, skin, nails and liver among other things. You can read more about it in this post from Dr. Axe where he explains what collagen is and 7 ways it can improve your health. 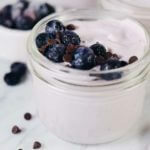 If you’re looking for a sweet, real food treat, this easy berry mousse is the way to go! It’s perfect for spring and summer and super easy to make. Let us know how it goes by leaving a comment below. Also, take a photo and tag us on Instagram @realsimplegood, so we can check it out! 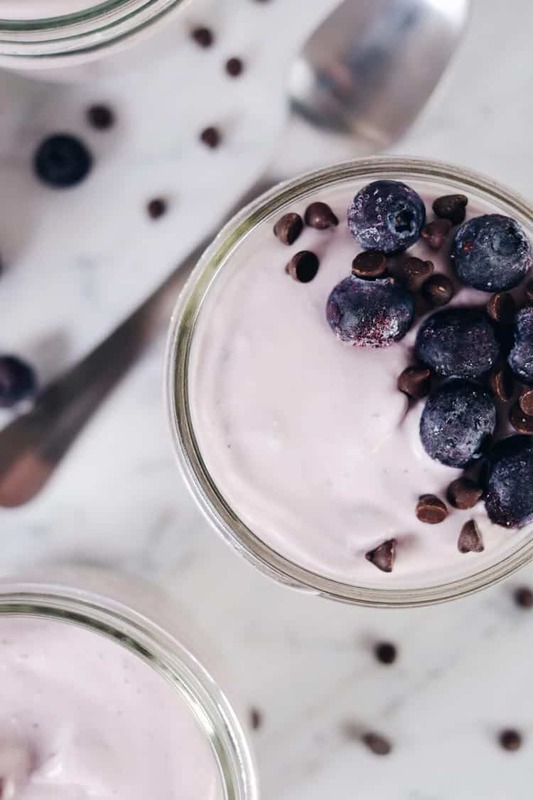 This easy berry mousse is decadent and light all at the same time. First off, make sure you refrigerate coconut milk for 12-24 hours first, and also make sure to use full fat coconut milk. Place all of the ingredients in a food processor and blend until smooth and creamy. Once creamy, pour into 4-6 small containers, cover and store in the fridge for at least 4 hours. 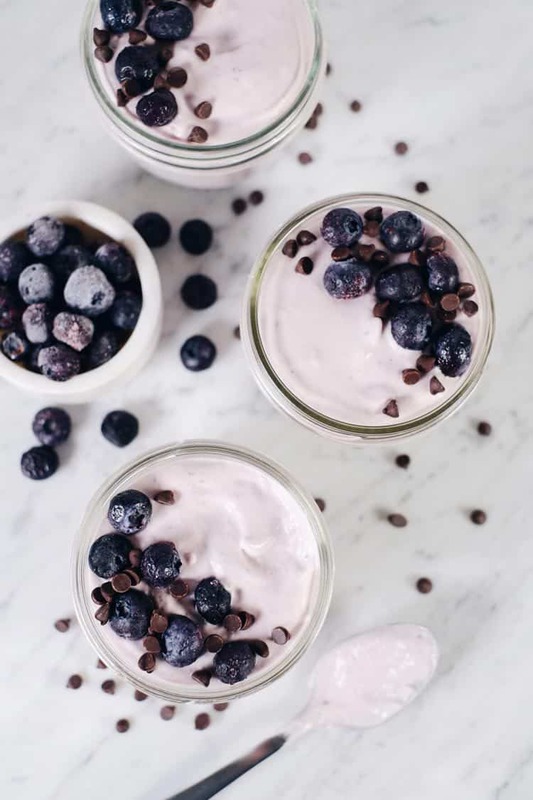 Serve with extra berries and any other toppings you'd like on top. Do you use the whole “can” of full fat coconut milk, or just the cream that separates after the refrigeration? This looks so yummy, thanks for a great recipe! So, we get full fat coconut milk that doesn’t come in a can, and it doesn’t quite separate like the canned stuff does. 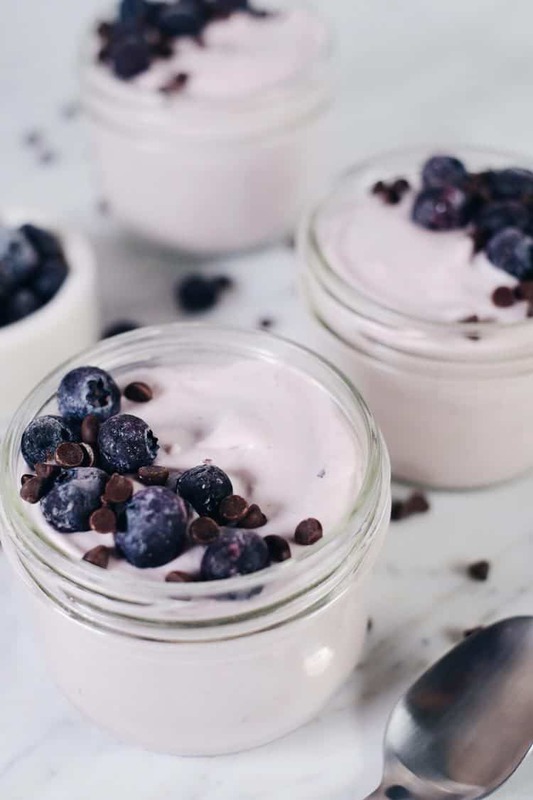 We use chilled full fat coconut milk, so I think just using the full can should work, but if you’re worried about it and want a thicker mousse you could just use the creamy part at the top and it will for sure end up great! If you do use the full can, let us know how it goes! Have a great weekend! Thanks so much for replying. I am planning on making this for my hubby and will let you know the results. We loved your salted caramel brownies, even without the caramel as I was in a hurry! I tried this with full fat coconut milk and it was watery. I would just use the cream. Guess I will make a smoothie in the morning with it! If you don’t have collagen, will the mousse still set? Could you use gelatin instead?